The wildly popular TV show Glee (imdb), with 19 Emmy nominations, has become a favourite show of mine Emmy nominees for best actress (Lea Michele as Rachel Berry), best actor (Matthew Morrison as Will Schuester), and in particular Best Supporting Actress (Jane Lynch as the mean and nasty Sue Sylvester) were a ton of fun to watch. 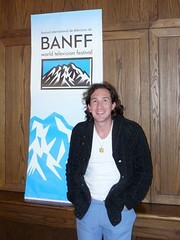 It was my great pleasure to meet, listen, and learn from Ian Brennan, creator/writer of Glee at the 2010 Banff World TV Festival. The following are video clips of Ian‘s Master Class and press conference. The following is Ian’s bio from Banff.